When Paula Papen caught her son playing on her iPad, she wanted to teach the 8 year-old boy a lesson about about having respect for her things. A video shot by the South Dakota mother shows her convincing the boy that he actually purchased the new $50,000 Ford Mustang while he was using her iPad. The boy was doing what any 8 year-old would be doing on Christmas break, looking at cars using his mom’s new iPad. The mom has a good time with the prank and decides to use a video camera to catch young Kenyon’s reaction after she tells him he purchased the expensive Ford Mustang and it cannot be returned. The video below shows Kenyon crying after he thinks he actually bought the $50,000 sports coupe. Paula Papen turned on her camera and asks her son, “why did you buy that $50,000 car on eBay?” The boy looks astonished and says, “I did?, can we cancel it?” His mom continues with the joke and tells Kenyon that it can’t be cancelled and he did hit buy and the car was theirs. He is sobbing uncontrollably, as his mom tells him the purchase of the new Ford Mustang is final. "Oh no, I'm horrible," he sobs. "We'll have to sell everything. I'm horrible!" Mrs Papen responds: "You're not horrible baby, you make mistakes." Kenyon tells his mother that he "didn't mean to buy it". After feeling sorry for her son, Paula Papen finally tells her son that he didn’t actually buy the car. She is heard laughing as she gets the most out of the prank. The video doesn’t say what Ford Mustang the boy was researching, but it was likely a new 2013 Ford Shelby GT500. 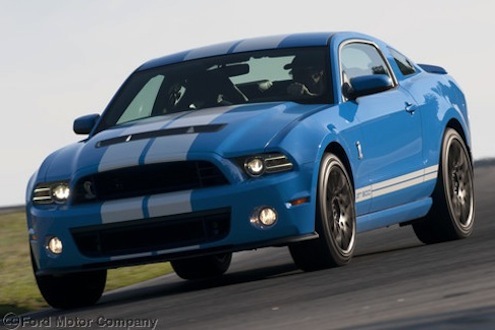 The starting price for a Boss 302 is $42,200 and the 2013 Shelby GT500 is the only Mustang with a $50,000 price tag. And what 8 yr-old boy wouldn’t want a new Shelby GT500? The Shelby GT500 is the most sought-after Ford Mustang on the planet. The all-new 2013 Ford Shelby GT500 is powered by a 5.8-liter supercharged V8 engine that pumps out 662 horsepower and 631 lb. ft. of torque. That makes the car the most powerful production V8 engine in North America. Any 8 yr-old that knows cars would be looking at the expensive supercar and not the base V6 model. A fun prank or a cruel joke? But the new video below of the the young boys emotional response after thinking he purchased a new 2013 Ford Shelby GT500, has sparked some outrage on social media with many branding Paula Papen’s actions as bad parenting and cruel punishment. What do you think? Was the South Dakota mom’s actions over the top, or was it just a fun joke she played on her son as she tried to teach him a lesson? Watch the video below and tell us your reaction. I would be lying if I said iv'e never pranked my kids.I don't find anything wrong with what she did.Priceless! Brene Brown (TED-speaker) said it nicely: "Kids are not perfect, they are hardwired for struggle." (probably paraphrasing) This was pretty innocent. Saw nothing wrong in this. BS! On Bad Parenting. The little shits are unformed humans who need to be shocked into the perspective that makes them view the world outside of their selfish little impulses, and the consequences of those impulses. My youngest actually did those things and his mother bailed him every time, today at 25, he can't even responsibly manage his debit account or his bills. It's all instant gratification. At the very least, he has become more careful.